Found this link about the SSW event of January 2013. "Stratospheric sudden warmings (SSWs) are a ubiquitous feature of the wintertime flow in the northern hemisphere." This looks to be an amazing documentary of this event. Thanks for the link crikey . Hey.Look at this! Really exciting. I just caught site of this amazing 10mb warm anomaly occurring in the southern ocean south of the OZ mainland atm. 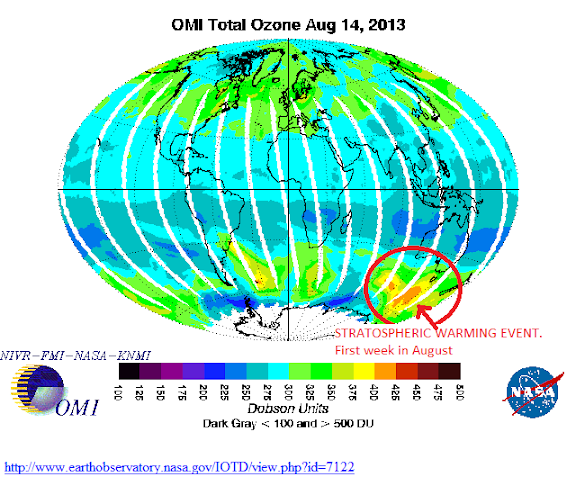 Is that a stratospheric warming event underway?? In the southern hemisphere.!! This is animation is hotlinked and should update. Will be interesting to see what this looks like now..The2nd June 2013? These events are renowned for bringing severe weather in connection with cold snaps and snow l believe. as downwelling of cold stratospheric air to the surface. It appears to have emerged from the Antartic and has moved into the sub polar latitudes. It could turn the AAO/SAM highly negative?? Crikey , you may I have found the answer to what no one else has been able to answer on the Tassie Forum. As far as I'm concerned you are a genius!! I've been banging on ( sorry whinging ) that we are cooking in Hobart. Around the date from this pattern we have had days way over average . Infact this week ahead is just incredible day after day of temps around 17 /18 and it should be 12 and Winter. No sign of this abating either. I knew something was very amiss, you may very well have found the answer. Any further info from anyone or yourself would be greatly appreciated. Awesome find that's for sure. Hobart the center for climate extremes !! Could that SSW could have anything to do with the drop in AO in the NH. From what I see though, AO was already low in Dec/2012, but perhaps the two still are related. 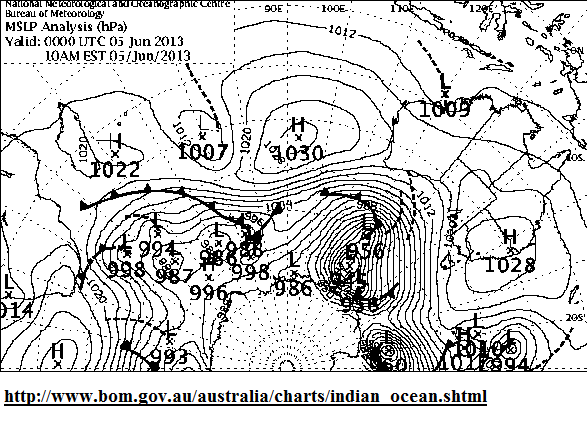 I wonder if that small patch of SSW south of Hobart could have been related to the drop in SAM second half May. However it was only a small brief drop, also the temperatures changes in SSW have been as much as 25deg in NH but only about 7deg in that patch south of Hobart. If that theory is right then that SSW south of Hobart is gone now given the rise in SAM and further forecast rise as well. Thoughts? Here's a few documented SSW events in the SH. Says there was an SSW event as recently as October 2012, but before that 2002. Apparently the 2002 even was the first major SSW event documented in the SH, very interesting. So it seems these events have a tendency to excite the SAM sending into negative territory. Amazingly the SAM bottomed out at -10.71 during that event. If I remember correctly though we baked in very hot conditions through Sep/Oct 2002, so not really seeing the connection to cold conditions during these events, at least in the SH. Hey..Thanks for your interest 'guys' . The animated image is even looking better for the 31st May 2013.. I have been looking around for some answers myself. Considering the rarity of such an event l am a bit astonished nothing has appeared on the WWW as yet? The NOAA observation of the Antartic oxone and stratosphere watch does not switch over from the NH until JULY..l believe. Wondering how long the SSW event takes from start to finish? Seems too early in winter for an SSW? I am in the process of collecting some souvenir snaps and research info' which l will post in the coming days.. Thanks for the links thus far. I am reading. Mountain H20.I am not sure re: your warm tassie' anomalies. What you suggest is not impossible as large perturbations like this in the atmosphere will produce a change in Jetstream behaviour at the horizontal layer and will produce waves in response both vertically and horizontally. This is a bit like an atmospheric volcano. Warm air is 'spewed' in to the stratosphere. As you would expect ,the flow on waves would be significant. I agree CS. The SH ocean is more likely to buffer sharp atmospheric shifts.. Lets see? GB. The NH events and SH SSW(Sudden stratospheric warming ) events are not related directly as they are events that occur on and near the poles in winter. SSW's are on the increase in the NH. Wonder if that will happen in SH as well..
One thing l have noted is the appearance of the sub polar jet., Very suddenly.This week ..
Look at the WZ sat' pic on the right of your screen and you can see how white the cloud is along the polar jet. Part of Heading your way Mountain H20. Go to this movie link. You will see the stratospheric anomalies around the sub polar region warm first and the warming becomes quite extensive around the pole until it is so intense the polar vortex splits in two..
occurred in October. The warming around the polar vortex at sub-polar latitudes would have happened first l assume. In what month of 2002 l am not sure. However it does look like this is an initialisation of a significant SSW event.? in June?? 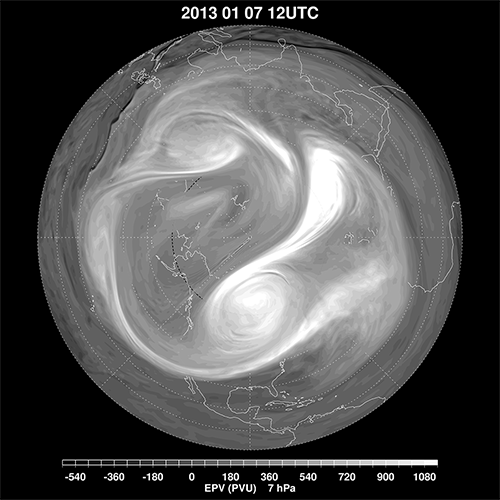 Splitting of polar vortex 2002. The only documented major SSW from the SH. Shame you can't slow the animation. ! The area of stratospheric warming in question is still relatively small but expanding. The sat'pic' shows a sub polar low but looks nothing out of the ordinary. However , the MSLP under the SSW is far more impressive . The wave breaks into the stratosphere which is about 20-40km altitude. The heat from the surface layer pushes up into the stratosphere. There is an expected downwelling of colder stratospheric air into the lower troposphere ( surface) but this article says there is a lag of ....30 to 100 days!! Preliminary results indicate that the timing of the downward response is controlled by (1) initial anomalies in the stratospheric polar vortex, and (2) by the initial strength of the lower stratospheric eddy drag. These two criteria are found to be sufficient to predict the surface response of the stratosphere-troposphere system 30 to 100 days after application of the forcing." 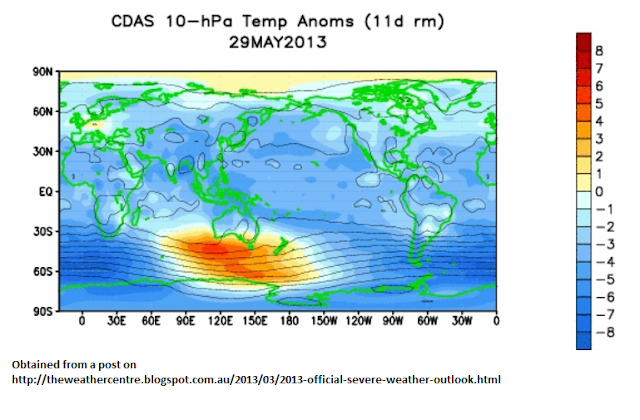 The SSW anomaly was over the southern Bight area on 1st June. As these SSW's are often associated with a deep low at the surface layer . A look at the MSLP tonight indicates a very deep low at the surface near our SSW. 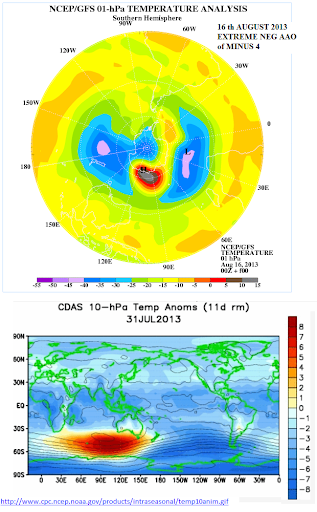 There were significant warm anomalies at the Antarctic surface of positive 10 in May 2013 . The month before the event. Here is the surface low ,with two large highs flanking the anomaly on either side. ACCESS G is showing some atmospheric anomalies near the region atm. lots of time. I expect? There is a deep Polar fetch on the western flank of that low that should advect some very cold air toward the Bight and southern ocean in coming days? After doing some reading on this developing upper air warm anomaly. I have found the dynamics quite complex. These warmings typically occur later in winter around July-October as a seasonal anomaly but this warming event underway seems a few months early?? So far l am not convinced this anomaly is consistent with a seasonal warming change commonly seen in spring!! Following the SSW in the NH in January we saw temps plunge there. Could a ireasonably assume we might see the same occur for the currently occurring SH event? Is this an indication that a month from now we might see a bitterly cold SH winter descend? I think the incidence of cold outbreaks in mid Laltitude northern hemisphere attributed to SSW, Locke, is probably related to the increased incidence of them ,rather than one SSW event on its own. The NH typically had a regular pattern of singular major SSW events in winter that timed and behaved according to the QBO phase (the upper wind regime over the equator). Over the past decade this this pattern changed substantially and the SSW events have became more frequent and independent of the QBO oscillation. Suggesting climate shift and changes to atmospheric circulation and chemistry? SSW major events in the SH Antarctic stratosphere have been rare. But we may see more with solar downturn?? I would think that this is one of the keys to the cold outbreaks and changing Jetstream in the NH and maybe for the SH in the future? This would create meanders or anomalies. However the interruption is short lived . I think the NH have been having multiple SSW's biennially. If the climate is to cool re: solar downturn , we would expect to see changes in the climate variables that amplify to produce the reduced temperature. So far in 2013 , the SAM (Antarctic)has been very positive keeping the cold locked in around the polar vortex with a strong contracted westerly belt. My thoughts re : cold outbreak is that we would need more than one SSW event. 2002 was a year of average snow depth at spencer creek. So lets see what happens..
As you know LOCKE. If we are to have a major solar minimum, we should expect some dramatic changes to our atmospheric circulation and climate variables.. The increase of SSW events may be symptomatic of a changing climate into a cooler phase? Information and my personal notes on this event here. Interesting posts there Crikey. Keep up your good work! Indeed and sorry for not echoing that feedback earlier - was great to read your thoughts - wonder if there is a connection with the SAM? There is apparently a 3-trough pattern (unfortunately no references) which is situated in the Southern Ocean which rotates slowly on a month/yearly (?) basis at those latitudes. Can't be sure of it, but may be a possibility . Also, I wasn't sure some time ago whether this would be relevant, but it looked like a signal of some kind (SSWs?) showed up in the tropopause temperatures on the GFS obs page. The coincidence between the SAM/AAO going strongly negative since JULY and dropping 6.4 !! index point and the timing of the stratospheric warming event certainly indicates a strong connection l would have thought.. This is however speculative but worth following .. I have noted that the westerly belt has been very wide during this SSW. One of the experts on these things is Karin Labitzke. Cosmic . Yes. I have read a little about various standing wave patterns / numbers in the SH . quote" N=4 standing wave-like patterns in the summer (DJF) mean sea level pressure (MSLP) and sea-surface temperature (SST) anomaly maps of the Southern Hemisphere between 1947 and 1994." I haven't read this yet but it is on my list. If we have a decent cold front..Maybe Check the stratospheric temperature spatial patterns . Ozone is meant to be produced in cold not warmer temps? Say Crikey how did you fine that image of ozone above I have gone to the site and some very good stuff there but I cannot find that one? Generated in 0.039 seconds in which 0.006 seconds were spent on a total of 13 queries. Zlib compression disabled.